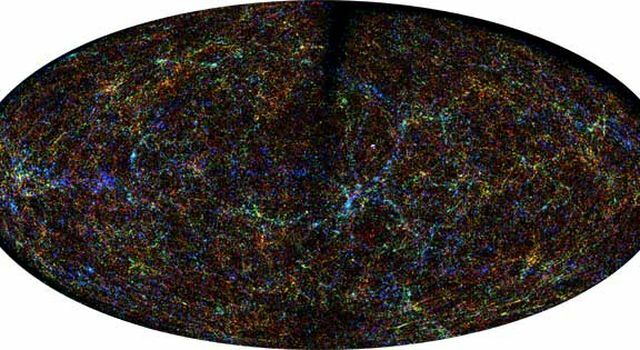 The celestial harvest from astronomy's most thorough high-resolution digital survey of the entire sky, completed by twin infrared telescopes, is now online for scientists to scrutinize and the entire world to savor. "The public will 'ooooh and aaaah' at the pictures, while scientists will mine the data for decades, learning a great deal more than we currently know about our Milky Way galaxy, its hundreds of millions of stars, and the millions of galaxies in the nearby universe," said Dr. Michael Skrutskie, principal investigator for the Two Micron All-Sky Survey. Skrutskie, with the University of Virginia, Charlottesville, was formerly with the University of Massachusetts, Amherst. 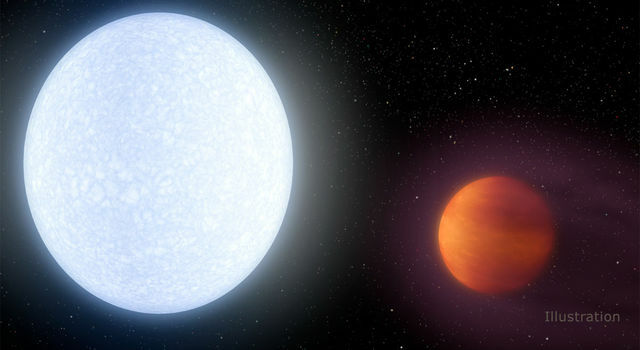 "This survey will change the way astronomy is conducted and the types of experiments that can be carried out, because astronomers can now sit at their desk and have data for any spot on the sky literally at their fingertips without going to a telescope," said Dr. Roc Cutri, the survey's project scientist at the Infrared Processing and Analysis Center of the California Institute of Technology and NASA's Jet Propulsion Laboratory, Pasadena, Calif. "It also makes astronomy more open to the public, providing beautiful pictures and serving as a powerful educational tool." The survey was conducted at infrared wavelengths, which are longer than the red light our eyes can see. 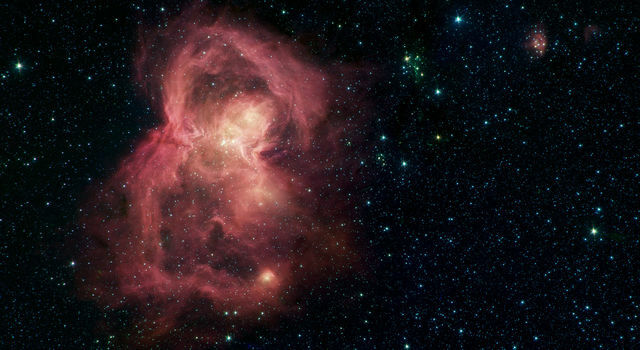 Infrared wavelengths penetrate dust better than visible light, making them an effective tool for detecting dust-obscured objects both inside and outside of our Milky Way. "For the first time in history, we can, in effect, step outside our galaxy and see it in detail, as it would appear from above," Skrutskie said. "We can also see the texture in the distribution of galaxies outside the Milky Way. Before this survey, astronomers tried to connect the dots, but nearly one-third of the galaxies were obscured by dust. Now, we can connect all the dots." "The idea of a survey is an old human activity, but the Two Micron All-Sky Survey has a modern twist," said Project Manager Rae Stiening at the University of Massachusetts. 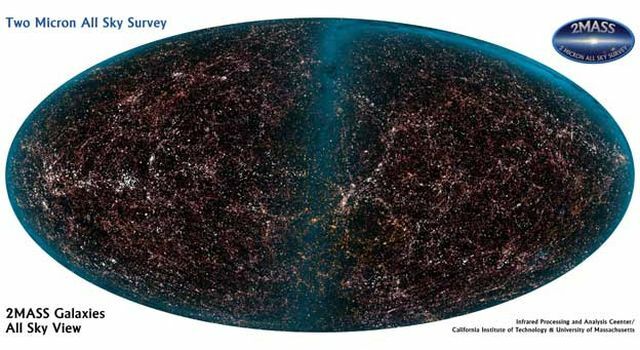 "Just as English admiralty sent Captain Cook and others to map the world, this new survey has mapped the nearby universe." 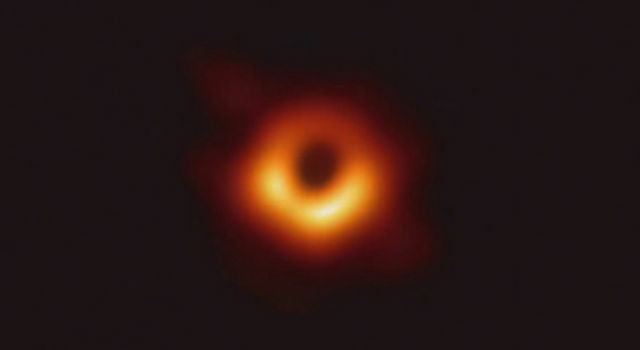 The project used two dedicated 1.3-meter (51-inch) telescopes, one at Fred Lawrence Whipple Observatory, Mount Hopkins, Ariz., the other at the Cerro Tololo Inter-American Observatory in Chile. Operations began in Arizona in June 1997 and in Chile in March 1998. 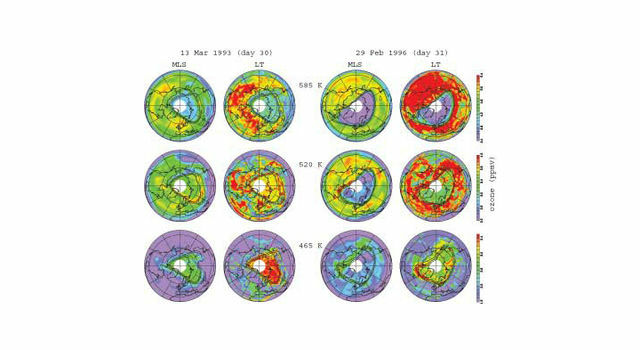 Since observations concluded in February 2001, scientists have been processing and validating data to complete the analysis of the entire sky. The atlas was compiled from 120 million images containing 14 trillion pixels, or data measurements. The survey produced catalogues brimming with nearly half a billion objects. For the next two years, scientists will conduct an extended Two Micron All-Sky Survey mission, reviewing and delivering more content of the raw data to the public. They will also process and release more sensitive observations made during the survey, including images of the entire Large and Small Magellanic clouds. "A lot of great stuff that will be discovered with this survey hasn't been conceived of yet," Stiening said. "The best is yet to come." 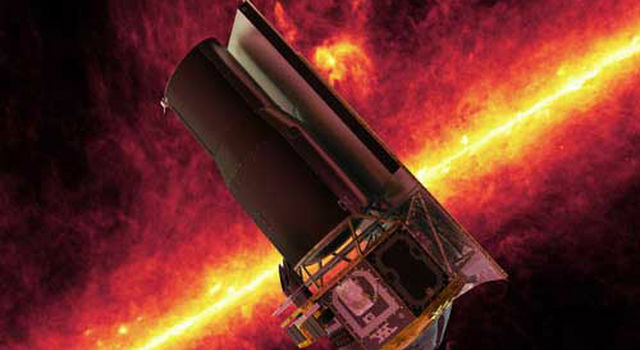 By identifying interesting targets, finding stars for calibration and providing data analysis techniques, the survey's data will be a boon to future infrared space missions, including NASA's Space Infrared Telescope Facility, scheduled for launch in April. The Two Micron All-Sky Survey is a collaboration between the University of Massachusetts and the Infrared Processing and Analysis Center. The Center developed the software system that converted the nearly 25 terabytes of raw digital data into images and catalogues. The University of Massachusetts was responsible for design, construction and operation of the survey cameras and telescopes. The project was first proposed in 1991 by Dr. Susan Kleinmann at the University of Massachusetts, and the Center director at that time, Dr. Charles Beichman. Previous infrared sky surveys by Caltech include the first such survey, by Drs. Robert Leighton and Gerry Neugebauer, and the first all-sky survey from space, by the Infrared Astronomical Satellite. JPL is a division of Caltech. The survey is primarily funded by NASA's Office of Space Science, Washington, D.C., with additional funding provided by the National Science Foundation. Additional information about 2MASS is available at www.ipac.caltech.edu/2mass.